A Thought Shared ....: Whatever became of Renaissance Man? 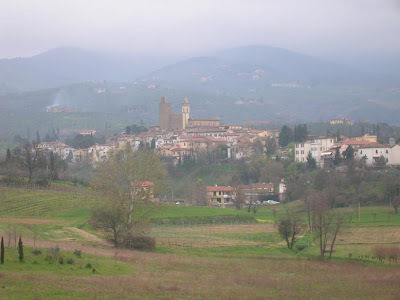 This is a town in Tuscany, Italy, and it looks like many other towns in that area. A pretty place, yes? It has a claim to fame that will be more obvious when I tell you the name of the town which is fairly close to Firenze (Florence). This is the town of Vinci. Not far from this place was born (1452) the man we know as Leonardo Da Vinci (Leonardo of Vinci). No, it was not a family name. He is known as Renaissance Man, but he was not the only person with that title. There were one or two others who displayed that same kind of talent across a wide range of subjects, but maybe not to the degree of Leonardo. He wasn't just multi talented, but regarded as a genius, and not only in his day, but for centuries after. His most famous achievements were in art, he being the procurator of the 'Mona Lisa', and 'The Last Supper', but he was also a skilled engineer among other things. He made drawings of more than a few things, laying down a variety of principles, one being that of the helicopter. Yet this man received little credit for much of his work, albeit mostly unpublished at the time, and left surprisingly little art, despite being one of the all time greats in the same league as Michelangelo. So what was the 'Renaissance'? Basically, it was a revivalist movement in the period between the 14th and 17th century, primarily in Italy but across Europe generally, dedicated to classical culture, invention, science, and the pursuit of knowledge. Leonardo Da Vinci was a major player almost at the beginning of the period. Notwithstanding the fact that the Renaissance came to something of a stop after the 17th century in favor of going to war for gains that were and still remain in the abstract dimension, is there still such an animal as Renaissance Man? The 19th century saw the Industrial Revolution take over. This was no renaissance, more a quantum leap in engineering, and it saw the rise of many great men, only this time there was much more a leaning towards specialization in one field. So, did Renaissance Man go the way of the dinosaur, becoming just one more entry in the book of time? Absolutely NOT!! Renaissance Man is alive and well, and he/she lives in suburbia, relatively unknown, no particular claim to greatness, and he/she can fix the car, the computer, the plumbing, the stove, the hairdryer, the mower and a whole host of other things, and in his/her spare time designs custom mouse traps for the garage, plays stuff on a guitar or keyboard, helps the kids set up all of the Halloween stuff up outside. And unlike Leonardo, he/she also has a full time job, working in an office, foundry, factory, store, park, forest, mine, school, hospital, or Emergency Services. You can't be much more talented than Renaissance Man/Woman 2000..